To access the configuration of GUI click on the setting icon Settings Vert of the configuration and then click on the User section from the top menu. Username: Enter the username in the format of username@domain (where domain is the domain of the company). Password: Enter the Password of the user. Extension: Enter the extension number of the user. Server IP 1: Enter the IP address of the PBX. Server port 1: Enter the port here which will be used by the Server to communicate with the GUI (default 5063). Server IP 2: Enter the IP address of the secondary server (optional). Server port 2: Enter the port used by the secondary server to communicate with the GUI (default 5063). Auto login on start-up: If this file is enabled then it allows the GUI to log in automatically with Windows Start. Set status to absent when GUI logs out: If enabled then the user status will be changed to Absent mode. 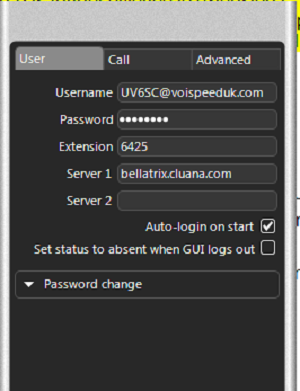 When the user logs out from the GUI with this status they will no longer be able to make or receive the calls. Change Password: Allows the user to change the password for their GUI. If the user changes their GUI password it will not affect their phone password. 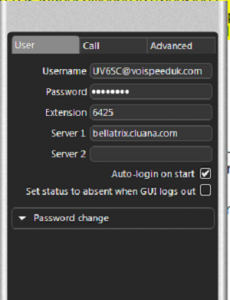 Note: VOIspeed6 uses the SIP subscription method to update the status of users. Each GUI performs individual point to point subscription to the server to update the information about users. The subscription method does not require information to be sent via message broadcasting to be updated, which allows the GUI to be on a different subnet from the server. Please note too that if you choose the GUI to be on different subnet from the phone server then you must establish the route in the router to allow communication between the two subnets.